They take pictures of moments we never want to forget, they play music that brings us to our own special place, the guide us when we are lost through satellite navigation and they provide us entertainment when we are bored. No-one will argue that smartphones are miraculous devices but there rise has come at the expense of stand-alone gadgets and everyday household object. Some will call this a positive thing - survival of the fittest. 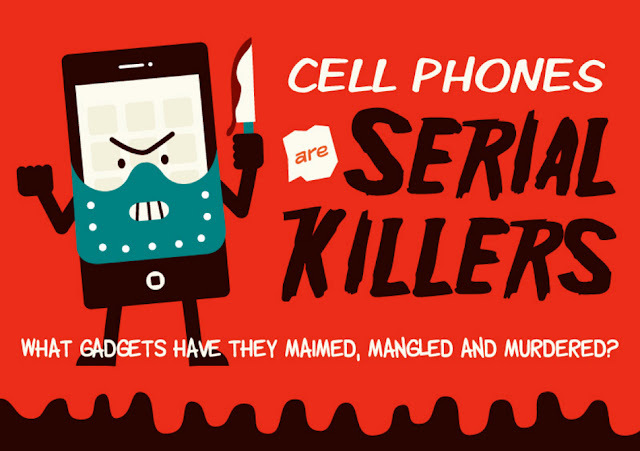 Some will call this a negative thing, they might even say that cell phones are serial killers. What Gadgets and Tools has the Smartphone taken out? Now that Google Maps has over 1 billion active monthly users, the stand-alone satellite navigation device has died out. It is also very rare these days to see a paper map for anything other than decorative purposes. Back in the day there was a communal, family telephone in every house. It was the only way to stay in touch. The smartphone means that those days are long gone, nowadays 41% of homes no longer have a landline telephone. In 2001, the iPod completely revolutionized the music industry. Fast forward 16 years and you would struggle to find a stand alone MP3 player or anyone that actually stores music on a device rather than streaming. Newspapers are still kind of hanging around but you will find that the vast majority of people read their content online and circulation is plummeting. This piece is clearly written with tongue in cheek. The smartphone is changing lives all across the world. It is truly a ingenious feat of engineering that all of these previously stand-alone devices can been compressed into a single device that slides into your pocket. We can only look forward to what the future has in store.